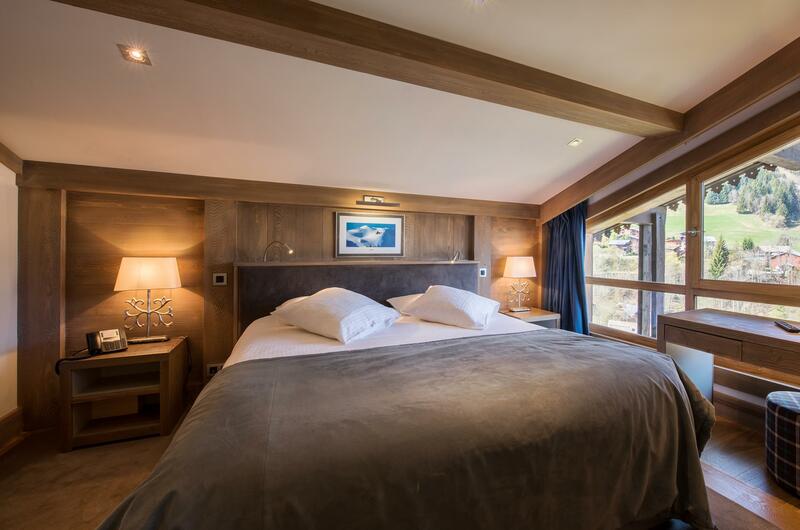 Each of the hotel rooms and suites expresses our vision of genuine luxury, offering the best of the hotel to our guests and the intimacy of a temporary "home from home" in Morzine. At the same time featuring escapism and intimacy, each of our three junior suites, seven family rooms (including one for PRM), 58 standard rooms and three single rooms offer the connoisseur – couples and families – an exclusive yet welcoming 4-star hotel in Morzine. The unique atmosphere emanating from every room owes much to wood, the ubiquity of which is down to the expert hands of a cabinetmaker who works with local materials, and to the owners’ desire to make every suite and room an invitation to journey into the heart of the Alps and of Morzine. This unique mindset, imbued with the authenticity of time-weathered chalets, brings together the top quality of the materials and the ongoing dialogue between the interior and exterior, between vegetal and mineral. This somewhat reflects the exceptional views opening up before our guests from beyond the bay windows. Each suite and room has its own "sensation themes"
To accompany the immersion of our guests, their escapism and their sense of being, in an authentic yet contemporary Savoie cocoon, we have blended tones to create a timeless elegance, from honey and greige to smoke and slate. These sensation themes invite the hands to discover a ‘story of the skin’, at the same time natural and sensual. In a setting of whitewashed walls and brushed larch, bespoke furniture and original photographs blend contemporary and clean notes, adding modernity and simplicity to the comfort of a retreat conducive to fulfilment and the inner journey. Each room and suite comes with an ensuite bathroom set amongst a refined design: grey ash ceramic flooring, slate sandstone walls, an ample alabaster-toned bathtub and solid wood grained with almost shaded tones.